We live in a data-driven world. Now more than ever apartment communities and management companies are pressured to show ROI on marketing dollars. 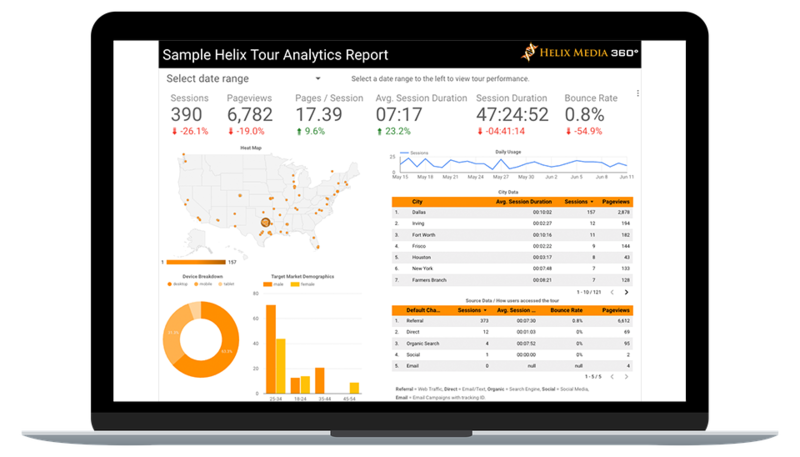 At Helix Media we believe in working with our clients to provide targeted analytics that show how your Helix Tour benefits your business. 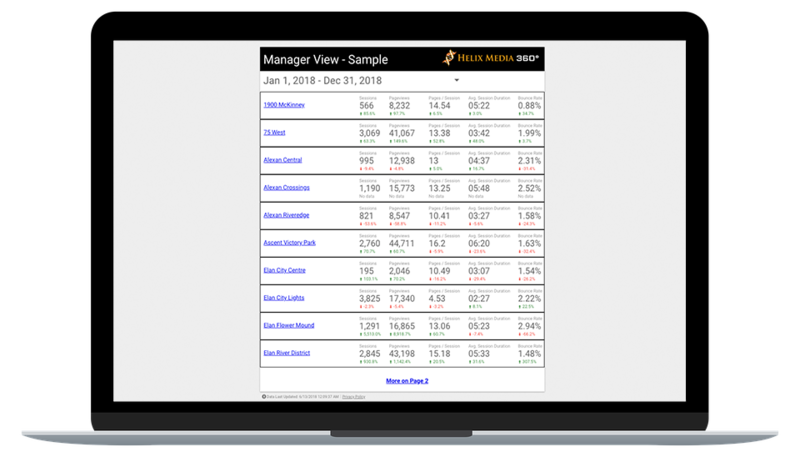 Our detailed view portal provides insight into user engagement such as: total number of sessions, number of 360 scenes viewed, average session duration, and bounce rate. See what cities your users are viewing your Helix Tours from and compare performance by city. We live in a mobile-driven world, and it is vital to make sure your Helix Tour is performing optimally on all device types; desktop, tablet, mobile and VR. Knowing which demographics uer your Helix Tour can help with overall marketing strategy. Helix Tours are very dynamic in how they can be used online. Our detailed analytics portal can compare engagement across various online marketing avenues such as your community's website, social media, email marketing and leasing tablets. Our Manager View portals are great for marketing managers and regional managers to easily and quickly track engagement across all Helix Tours. See user engagement of all Helix Tours within one report such as: total sessions, number of 360 scenes, average session duration, and bounce rate. Our Manager View portals are not only great for seeing which Helix Tours are performing best, but also potential issues, which can happen if a website is not displaying a tour properly. Each project's title links to the corresponding Helix Tour's detailed view if you need to see more information.